Whoâ€™s still recovering from YALLFest this past weekend? ðŸ™‹ Iâ€™m definitely suffering from Post-YALLFest Sadness Syndrome right now. I may work for a publishing company, but I miss the energy and love for YA books that all of yâ€™all emanated. Weâ€™re feeling so blessed because the book gods came through and gave us perfect weather for the weekend. 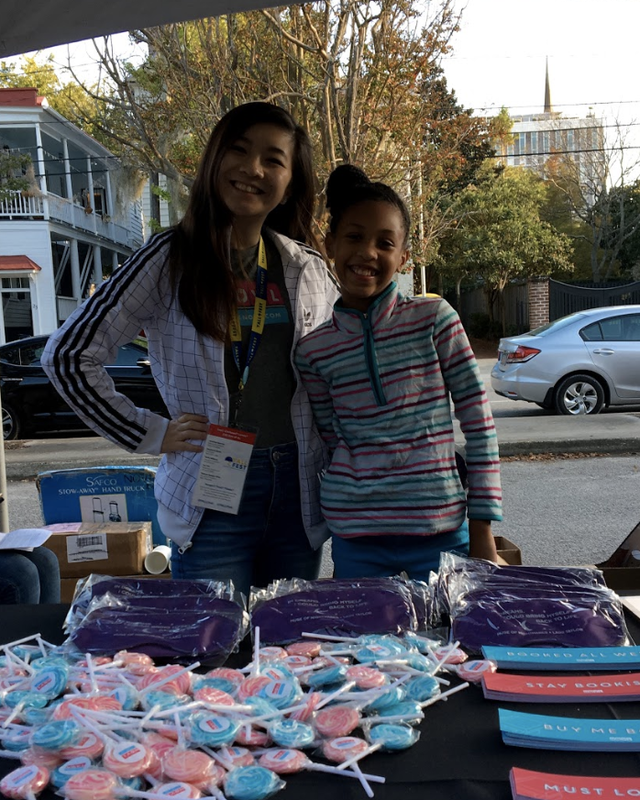 Natali, Katharine, and I had so much fun meeting yâ€™all at both the NOVL Sâ€™mores and Pours event as well as the festival day. Thank you to everyone who came by to say hi, even when we werenâ€™t giving out any swag or books! This was my third YALL, and I have to say that it was by far my favorite one. We kicked off the weekend with the NOVL Sâ€™mores and Pours at the Courtyard Marriott Charleston Historic Districtâ€™s adorable pergola! First of all, look how cute all the book lovers look together! Second of all, doesnâ€™t NOVL look so stunning over the ivy leaves? We gave a preview of the forthcoming Internment by Samira Ahmed, where all attendees got a limited edition READ TO RESIST baseball cap. Then Monica Hesse came to speak about her most recent novel, The War Outside. It was the perfect start to the weekend, and honestly, weâ€™re still on a high from it. â€¦because the bookworm is already awake and in line at YALLFest. Okay, yâ€™all wake up earlier than we do for YALLFest, and we have to set up entire boothsâ€”such dedication. These NOVLers were the first people in our lines on multiple occasions, which means that this LINE START sign basically stayed with them the whole day. Not to toot our own horn, but pink and blue look so good together. It reminds me of cotton candy, which is sweet like all you NOVLers out there. Our booth exploded in pink and blue, which is the only way to go. We hope yâ€™all grabbed these tote bags, buttons, and stickers, because theyâ€™re all being redesigned! We had not one, but TWO book lovers who insisted on coming behind the booth to experience what itâ€™s like to be a full-time book lover. To be honest, though, we think they rocked it better than we did. Am I looking at NOVLâ€™s YALLFest team for 2035? Katharine, a publicist here at LBYR, had a booth similar to Lucyâ€™s to give publishing advice. Whether it be on how to get a book published, how to receive review copies, or how to get your foot in the door in publishing, Katharine had words of wisdom to share. Letâ€™s be real, thoughâ€”I know from personal experience that she gives the best advice on any aspect of life. 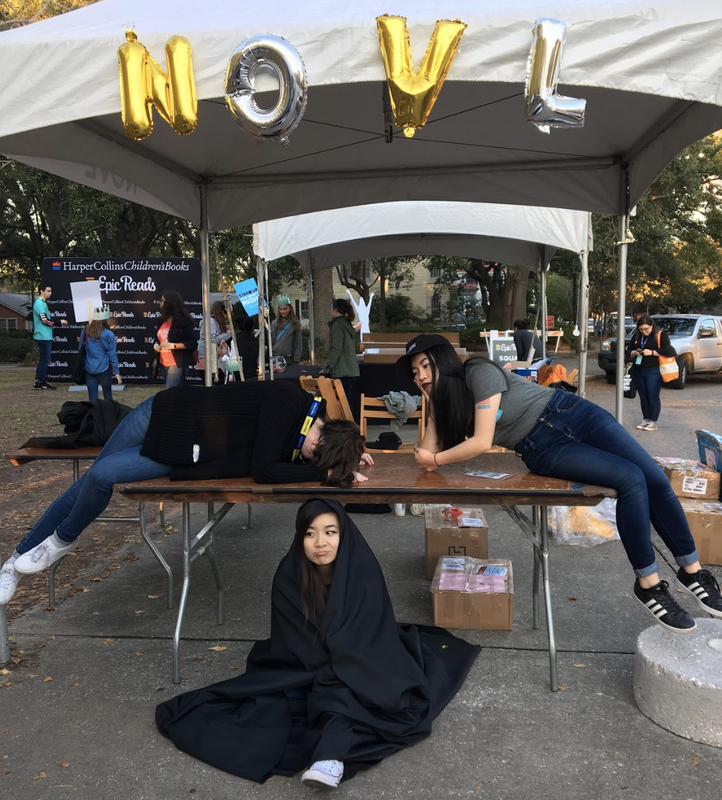 It might look like weâ€™re exhausted (we were), but we were mainly sad that YALLFest 2018 came to an end. We may be sleep deprived, but weâ€™re still glowing from all the love that yâ€™all showed NOVL this year. Up next is YALLWEST in bright and sunny Santa Monica, and we canâ€™t wait to see yâ€™all there. In the meantime, weâ€™ll bond over YA online! P.S.â€”Shout out to these NOVLers for agreeing to my antics and dancing for social media early in the morning. Love yâ€™all!